Highest Paid Managers In Europe’s Top 5 Leagues: Who Is Manchester City Boss Pep Guardiola Eclipsing? Following on from their revealing of the top-10 highest paid footballers from Europe’s top-five leagues, which is available to view here, French publication L’Equipe have gone on to provide the best paid managers currently plying their trade in England, Spain, Italy, Germany, and France, and if you thought the Premier League would be the one with the most attractive employment - from a monetary point of view - you may be surprised. The renowned publication’s annual salary report breaks down pay per month, pre-tax and it’s looking like Diego Simeone’s getting the round in. The Atletico Madrid boss, who has been a the helm of Los Rojiblancos since 2011 is the highest-paid manager in Europe. During his time in the Spanish capital, he’s brought a La Liga title, a Copa del Rey, and two Europa League trophies. He’s rewarded by taking home €3.3million per month, or an eye-watering €39.6million a year. The bumper pay packet certainly stands out with the help of the current turmoil surrounding who’s steering fierce rivals Real Madrid at the moment. Pep Guardiola is next on the list, receiving €1.9million a month at Manchester City, who can obviously afford it with the oil money continuously flooding in. The former-Barca boss blasted English records with the Blues in 2017/18, producing a 100-points season and is now looking to secure back-to-back titles for the first time in their history. Juventus’ Massimiliano Allegri - linked with a move to Manchester United recently - currently earns €1.14million a month. The 51-year-old has continued the Old Lady’s run to chalk up an extra four Scudettos to their unbroken seventh Serie-A winning streak. Understandably, the salary drops significantly in the other leagues with the top clubs’ more recently assigned coaches. 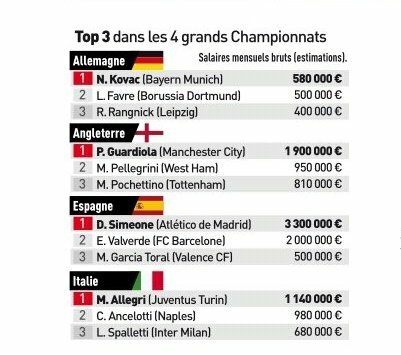 New Bayern Munich manager Niko Kovac, whose quest to help the Bavarians retain the Bundesliga is looking increasingly in jeopardy, pockets €580k before perpetually under-pressure Paris Saint-Germain boss Thomas Tuchel - also appointed in the summer with the onus on him bagging the Champions League for the Ligue 1 champions - collects €420k.